What is My Personal Injury Claim Worth in California? One of the most frequent questions asked is how much is my personal injury case worth. While seemingly an easy inquiry, an experienced attorney knows that the answer is anything but simple. The final amount reflects not just specific economic damages but also the toll the accident takes on the victim, known as pain and suffering. We created this claim calculator to help give you an idea of how it works. The financial loss you suffered due to an accident is known as damages. After your attorney knows the details of your case, the damages will be determined. It is possible to get an “about” figure of how much your injury claim is worth, using our injury calculator. Let’s answer the questions and fill in the amounts in the form below to see how the are damages calculated. Were you partially at fault? If so, indicate percentage. Noneconomic damages are decided by the jury. Your attorney will suggest a level of necessary compensation and provide compelling reasons why it is needed. The judge instructs the jury that they are not held to a set calculation, but that based on the case, they decide on a reasonable and fair amount. There are two types of damages: economic and noneconomic. Medical Expenses: This includes all monies spent on medical treatment and diagnostics, including hospital bills, ambulance fees, doctor visits, surgery costs, lab and radiologic services, nursing care, prescription medicines, rehab therapy, and in some cases, occupational therapy if directly related to the accident. Household Services: This refers to duties that an injured individual can no longer perform around the home due to the accident. The cost of hiring someone to do them is considered a special damage. Future Lost Wages: This includes the ability to earn a living in the future. Normally, a jury will consider such things as the individual’s age and training, profession and how long the individual is expected to live. Expert testimony is usually needed. Medical Care in the Future: If the probability of future medical care is anticipated, this is usually substantiated by the opinion of a medical expert. *The defendant is the person against whom the claim is lodged, and the plaintiff is the individual who was injured and who is filing the claim. Negligence is the basis of all personal injury lawsuits, and it is imperative that an attorney proves negligence. So, what is it specifically? 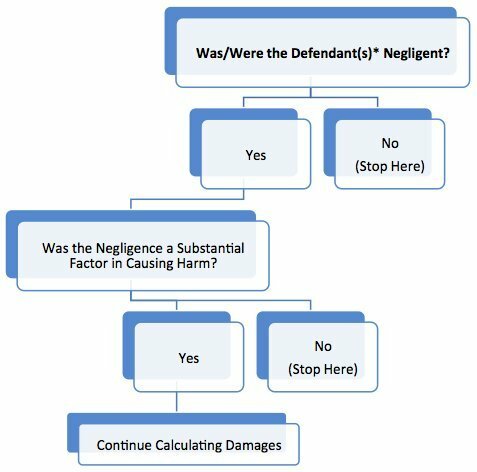 Negligence is based on the assumption that, in specific situations, individuals have a duty of care or a standard of behavior that is expected. If, for instance, someone is motoring on the highway, it is expected that he or she will behave in a responsible manner, keeping other motorists safe. When someone fails to do that, they are acting in a negligent manner. There’s more to it. Let’s say the motorist fails to use turn signals and causes an accident that results in injuries to other drivers. The motorist may be responsible for paying the financial loss the injured person incurred. An attorney must prove that the motorist’s breach of duty to others resulted in the injuries and the monetary loss. This is called proximate cause. Once proven, the case for reparation of damages can proceed. Sometimes the plaintiff is partially responsible for the accident. For instance, in our example above, the defendant did not use a turn signal. However, the plaintiff may have been speeding. In this case, the plaintiff might have been partially responsible for the harm the accident caused. In California, a plaintiff who is partially responsible is still able to be compensated for the percentage difference. 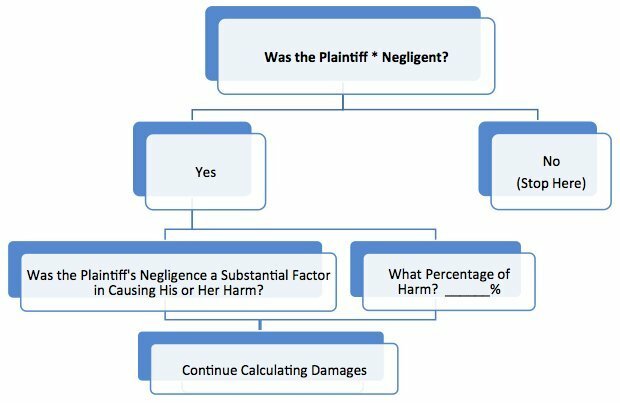 So, if a case is worth $100,000 and the plaintiff was 10 percent responsible, he or she can be compensated for 90 percent of the damages or $90,000. The concept of damages in a personal injury case is a basic one. In fact, the damages are the financial foundation upon which a jury verdict or settlement is built. Since each case is different, the final settlement is modified by the specifics of the case and David’s considerable experience in fighting for maximum compensation. With a record of winning 98 percent of his cases, David shows his dedication in helping clients move past the trauma of an accident.